Because of the heavy use of antibiotics, oral contraceptives, animals fed antibiotics, changes in the food supply, medical interventions, and lifestyle issues, there has been an alarming increase in mycotic (yeast) infections of many types . Contrary to popular belief, it is not necessary to have a vaginal yeast infection to have yeast-related problems like diarrhea, reflux (like GERD), eczema, itchy red patches etc. [2,3]. Vaginal yeast infections, also are problems , and have also responded to nutritional interventions [1,3,4]. Yeast and fungal infections can also cause itching, discomfort, and a variety of skin complaints like rashes, eczema, psoriasis, dry skin patches, intense itching, hives, and open cut-like sores [1,2]. They also may be an unfound factor when people have weight problems or when they seem to have multiple “food allergies” . 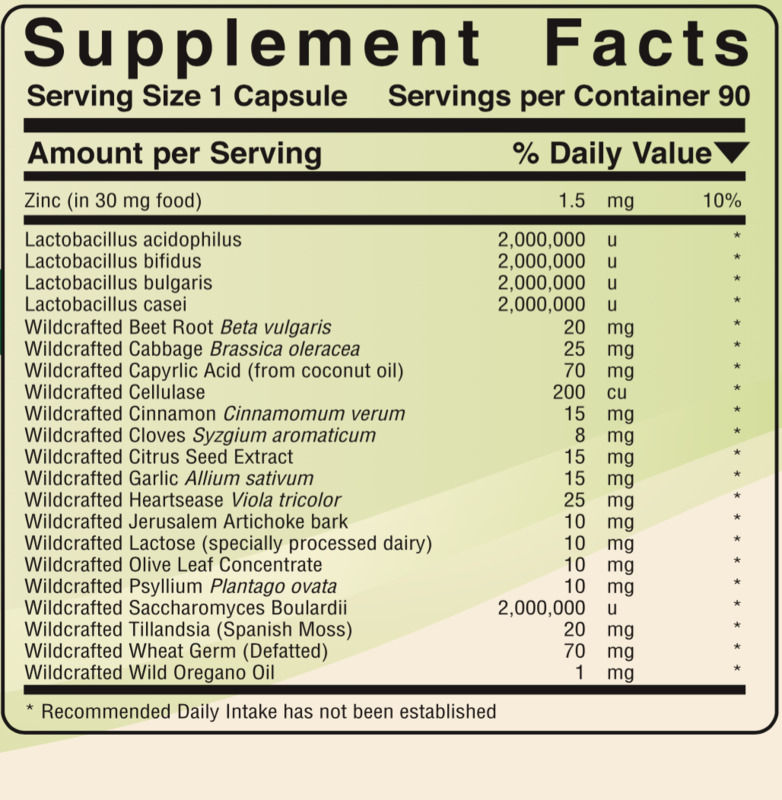 Probio-Zyme-YST contains a variety of prebiotic, probiotic, and anti-fungal herbal ingredients. Products like it have long been used as intestinal detoxificants [4,5]. Combining pre- and pro-biotics seems to enhance effectiveness . “Diarrhea has infectious, drug-indued, food-related, postsurgical, inflammatory, transit-related, and psychologic causes…Diarrhea is a symptom; when possible the underlying disorder should be specifically treated, but more often symptomatic treatment will also be necessary” ; sometimes fluids and electrolytes (which are not part of Probio-Zyme-YST may be indicated). Some people alternate from constipation to diarrhea . It has been claimed that, “The most common cause of diarrhea is inflammation of the intestines due to bacterial or mycotic action. (The latter frequently as the result of antibiotic therapy which disturbs the symbiotic relation between fungi and bacteria). The irritation causes a hypertonic reflex action and peristalsis is increased until the cause is removed. Loss of body fluids may occur during its course” . Beet with specially processed Tillandsia usneoides have been claimed to support, “Gastro-Intestinal Symptoms (Diarrhea, constipation, malassimiliation…heartburn, etc. )…Diseases Associated with Toxemia…Symptoms Associated with Toxemia (Such as tachycardia, fever, halitosis, body odor, skin pallor, diarrhea etc.)” . Many decades ago, Royal Lee, Bill Hansen, and David Roderick worked together. A special type of biological process for digestive support was developed around that time that David’s son Steven Roderick uses for Probio-Zyme-Yst. Beet root contains substances, like fiber and natural sugars , that can have prebiotic properties. It has long been used in yeast-type formulas . “Cabbage protects the mucous membrane of the stomach from gastric hydrochloric acid…attributed to…vitamin U .
Caprylic acid has antifungal properties . Caprylic acid given orally by capsule antagonizes Candida colonization of the small intestine . Cellulase digests cellulose . Digested cellulose acts as prebiotic material and hence helps increase the probiotics in the body. “Cellulase is used as a digestive aid...and for the management of flatulence . Cinnamon has antimicrobial and antifungal properties . Citrus seed extract “is highly effective against viruses, protozoa, bacteria, and yeast” . “Clove oil is used internally for stomach ulcers…halitosis…flatulence, colic, gastropathy, and anorexia” . It has “demonstrated antimicrobial activity towards Candida albicans” . Garlic is “used for gastrointestinal aliments, particularly digestive disorders with flatulence and gastrointestinal spasms…and as a tonic for diverse illnesses and debilities” . Heartsease is a pansy-like flower that “has a soothing, salvelike effect due to its mucin content: in animal experiments, oral administration brought about an improvement of eczema-like skin conditions after long-term use” . It is speci- fically indicated for vaginal itching . Recent research has concluded that it may have anti-inflammatory properties . Jerusalem artichoke contains inulin that has “health-promoting prebiotic effects” . In other words it “feeds” the good probiotics and improves that “portion” of the immune system. Lactobacillus acidophilus, Lactobacillus bifidus, Lactobacillus bulgaris, Lactobacillus casei: “Lactobacilli are the predominant microorganisms of the vaginal bacterial microbiota, and they play a major role in the maintenance of a healthy urogenital tract” . Lactobacillus acidophilus and Lactobacillus casei have been shown to effectively treat chronic diarrhea . 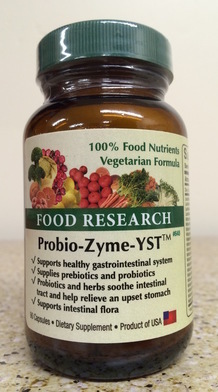 Multiple lactobacilli, such as in Probio-Zyme-YST are normally preferable for supplementation and are also used for those with vaginal yeast infections and vaginal bacterial infections . Lactose is considered to be a prebiotic  and has been used as part of an antidiarrheal, anti-yeast formula for decades —presuming those taking it are not lactose intolerant. Olive Leaf Concentrate, Oleo europaea ,is a remarkable herb. Olive leaf compounds have successfully repelled the growth of Candida albicans, Escherichia coli, Klebsiella pneumoniae, Bacillus cereus, Aspergillus flavus and Aspergillus parasiticus [18,19]. Psyllium has been found to be useful for chronic constipation and some forms of diarrhea . Saccharomyces Boulardii is a probiotic. And by itself, or in conjunction with other probiotics has been found effective for diarrhea . Wheat germ can be helpful as: “ingestion of probiotics and wheat germ assists in parasite clearance” . Wheat germ seems to possess one or more elements that have antifungal properties [22,23]. Wild Oregano Oil, Origanum vulgare, has been reported to have effectiveness against yeast infections , parasites , bacteria , and viruses . “Origanum oil at 0.25 mg/ml was found to completely inhibit the growth of C. albicans in culture…The results from our study encourage examination of the efficacy of origanum oil in other forms of systemic and superficial fungal”, especially with an olive extract . “Psoriasis and eczema may respond to” wild oregano . “Essential oil of Oregano inhibited Candida albicans growth…similar to that of Nystatin” . Zinc supports the immune system and has been found to be helpful for certain types of diarrhea . Unlike nearly all zinc-containing products, Probio-Zyme-YSTTM only contains food zinc in a food (Saccharomyces cerevisiae) that helps the body fight infection . Detox “refers to symptoms generated by a detoxification process. As the body begins to deal with dead microbes, one may experience a variety of detox symptoms. This occurs when invading organisms die…Common reactions include fatigue, diarrhea, headaches, muscle/joint achiness or flu-like symptoms. Some people may develop a rash…The best way to maximize the power of olive leaf extract and limit any adverse reaction is to drink four cups of water in between usages. Water helps to strengthen the lymphatic system and flush the kidneys…Die-off effect is only temporary” ; this also can be true for oregano and other substances. The body is designed to normally heal itself, though even scripture sometimes credits edible leaves (and even water, cf. John 5:4;7:38) as part of the process. While a “detox” reaction is theoretically possible with products such as Probio-Zyme-YST, they are not common.